Moving on to the good part: I am quite in pace with my stipulated GSoC time-line. Also, I have created both the ‘ArtiKulate বাংলা’ (ArtiKulate Bengali) and the ‘ArtiKulate हिन्दी’ (ArtiKulate Hindi) courses. In the Bengali Course, I am done with translating seven whole units to Bengali along with all the unit titles. In the translated units, all the related phonemes have also been tagged for every phrase. Below, you can see a part of the ‘আবহাওয়া’ (Weather) scenario unit showing some words, expressions and sentences. In the Hindi Course, all the unit titles have been translated to Hindi. By Week 7, I will be done with translating the entire Basic Course Skeleton to Bengali as well as Hindi and the recordings for the Bengali Course should also be ready by then. In other words, the ‘ArtiKulate বাংলা’ Course will be completely ready by Week 7 and the ‘ArtiKulate हिन्दी’ Course will only have the recordings left. BTW, all the Akademy 2013 attendees, please DO NOT forget to attend the two BoFs on Artikulate scheduled on Wednesday, July 17. The BoFs will be organized by Andreas Cord-Landwehr (IRC Nick: CoLa) on ‘Personas for Language Learning Apps’ and ‘How to contribute to Artikulate’ at 09:30 hours and 10:30 hours respectively. Its been more than a month since I last blogged, so, here are the updates of the month that was by far the most eventful month in my life so far. I get a mail from my mentor, Andreas on the 2nd of May saying that I should apply for the Google Summer of Code, 2013 with Artikulate for KDE, May 3rd being the last day of proposal submission. And so I made the application which took me two hours. You’ll find the link to my proposal here. 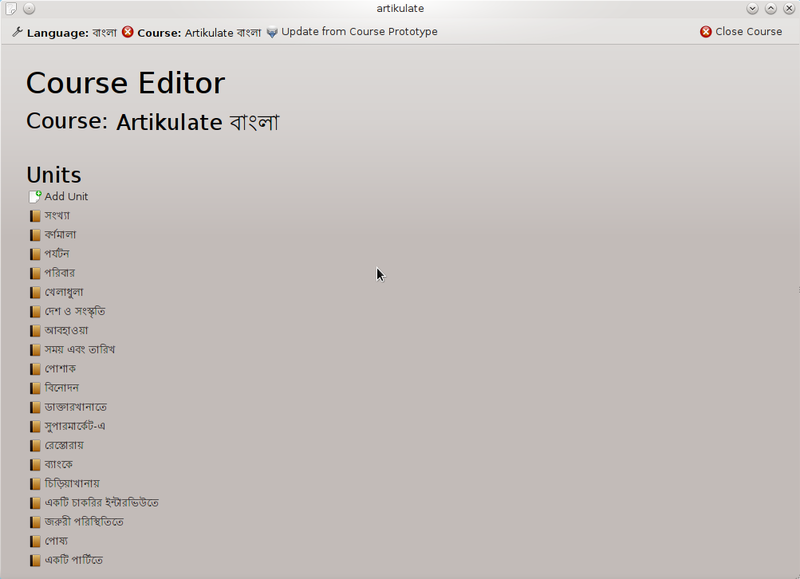 By then, I was done with adding Bengali to the list of languages in Artikulate. One fine day, Tina wakes up and receives an offer letter from one of the most prestigious colleges in Germany. It has been her dream since she was twelve which has finally come true. But, the offer letter states that two of her lectures will be in German. Now Tina, who is born and brought up in India took classes in German an year ago which made her capable of reading, writing and understanding the language with ease but faces a real tough time trying to speak the language herself. She has very less time at hand and does not want to take any more classes now. So what does she do? The answer to her problem is Artikulate. She opens the program and selects ‘Deutsch’ (German) as her language and proceeds with the courses provided. After completing each course, the program notifies her about her progress which helps her to perfect herself in speaking German. The project contains different courses in various languages which in turn offer a variety of scenario units. 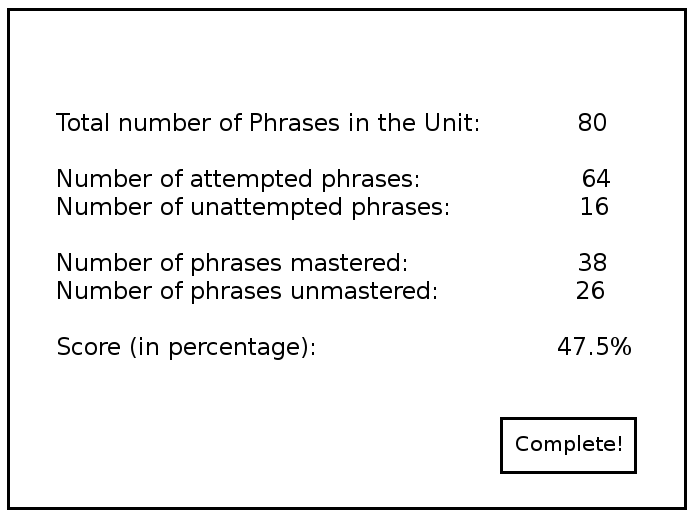 A scenario unit consists of phrases of all lengths like words, expressions, sentences and paragraphs that are most likely to be required in the particular scenario (mentioned in the unit) in a foreign land. The idea is to have recordings of each phrase by native speakers and related phonemes (any of the perceptually distinct units of sound in a specified language that distinguish one word from another) will be tagged to every phrase. Tina can now listen to the recordings of the phrases and the phonemes and try speaking them the same way, recording her own attempts in the process. By comparing the two recordings, she can correct her pronunciations in German (the language of preference in this case). *Phrases of all four different types (depending on their lengths): word, expression, sentence, paragraph shall be present. *Covers all the relevant phrases for the scenario given by the respective unit. *Contains enough phrases so that the user spends atleast 10 minutes testing an entire unit. *Word: Lunch, Dinner, Buffet, Starter, Main-course, Desert. *Expression: “Delicious!”, “Yummy!”, “Lip smacking!”. 2. Currently, Artikulate supports eight languages with no or incomplete courses. The idea is to build up on the basic course skeleton and create courses for each language using units already present in the course skeleton by the translation of every phrase. For example, the unit ‘In a Restaurant’ becomes ‘একটি রেস্টুরেন্টে’ in Bengali and ‘In einem Restaurant’ in German and the word ‘Dinner’ in the same unit becomes ‘সান্ধ্যভোজন’ in Bengali and ‘Abendbrot’ in German. 3. Another vital part of the project is the recordings of all the phrases and tagging of related phonemes for every phrase. For this task, help of native speakers or speakers with sound knowledge of the pronunciation of a particular language is essential. I plan on taking help from the KDE Community as it has contributors from all over the world. I feel community meetups would be the best place for this task. I have thought of organising an event during Akademy, 2013 along with my mentor so as to attract native speakers from the KDE Community to contribute to Artikulate with recordings of phrases and tagging of phonemes. Long term goal is to arrange similar events at national/regional level KDE meetups like conf.KDE.in and others. Here tagging of phonemes for a phrase refers to tagging all the phonemes that are used atleast once in the particular phrase from the the list of phonemes provided. For example, for the English word ‘bed’, the phonemes that will be tagged are [b], [ɛ], and [d]. 4. Also, I plan on adding Bengali which is my mother tongue to the list of languages very soon. So, I will be creating the course files and do the recordings of the phrases and the tagging of related phonemes for Bengali within the project period. For the recordings, I also plan on asking some of my friends and acquaintances, who are native Bengali speakers, to lend their speech so as to have a good variety of recordings. By the end of OPW, the basic course skeleton shall be provided in at least two languages, German and Bengali for example, by human translators and contributors (native speakers) in the KDE Community and localization teams. 1. For Users: How to use the program i.e., selecting courses, listening to the recordings provided, recording their own attempts and, improving their pronunciation by comparing the two. *How to write language files. A language file is an XML file contained in the artikulate/data/languages directory which contains the phonological specifications of that particular language. *How to create new courses using the Course Editor. *How to edit the course skeleton and add new units to it using the Course Editor. *How to set the path to the checkout of ‘artikulate-data’ in the “Settings” configuration dialog. Planned Outcome: A complete manual for Artikulate by integrating this handbook into the program. For the task of workflow planning, I plan to create a .txt file in the main directory of the Artikulate project which will contain written details of what features will be added, what changes will be made and when and how team Artikulate plan on implementing them. It will be updated with every release. This will help in the smooth functioning of the Artikulate team. Also, users and contributors who will clone the project and build it from source will get an idea on the development process of Artikulate and can easily find out the optimum way to contribute to the project. Problem: Tina, in order to improve on her pronunciation skills in German, opens Artikulate. The very first screen she comes across, contains the list of languages supported by the program from which she can choose the language of her preference. Since, in Artikulate every language is in its respective scripts, Tina instantly recognises ‘Deutsch’ to be German as she is able to read the language, but has a hard time understanding what other language options like ‘Ελληνικά’ mean. Here, when Tina hovers her mouse pointer over any of the language options, she gets further information about the language in brief, Greek in this case. In the future, the information about languages might be fetched automatically from websites like Wikipedia instead of writing it down for every language. Problem: After selecting the desired language and a corresponding course, Tina selects a scenario training unit of her choice. Now, she finds a screen where there are phrases of four types: word, expression, sentence and paragraph. After listening to the recorded phrases, she tries speaking them in the same way, recording her own attempts in the process so that she can compare between the two recordings and correct herself. But, the problem that arises now is that except for her own discretion, there is no other way to evaluate her progress. Beside every phrase there will be two buttons (options), ‘Thumbs Up’ which will denote that she has been able to master the phrase, and ‘Thumbs Down’ which will denote that she has not been able to master the phrase yet. The program will keep a track of the number of phrases that Tina tried, marked ‘Thumbs Up’ or ‘Thumbs Down’ and the number of phrases she skipped so that after she clicks on the ‘Complete!’ button, the program will give her a feedback. Future Work: Implementation of a ‘highscore’ system in the program which will be able to compare between two given recordings and mark the user accordingly. Also, once there are quite a number of courses available for every language, a difficulty level can be introduced to help the user select between the courses. Around a month back, I came across a very interesting project in KDE’s list of ideas for OPW (Outreach Program for Women) –> Artikulate. It is a basically a pronunciation trainer which aims at improving and perfecting the pronunciation skills of the user, thereby helping in speaking foreign languages with ease. 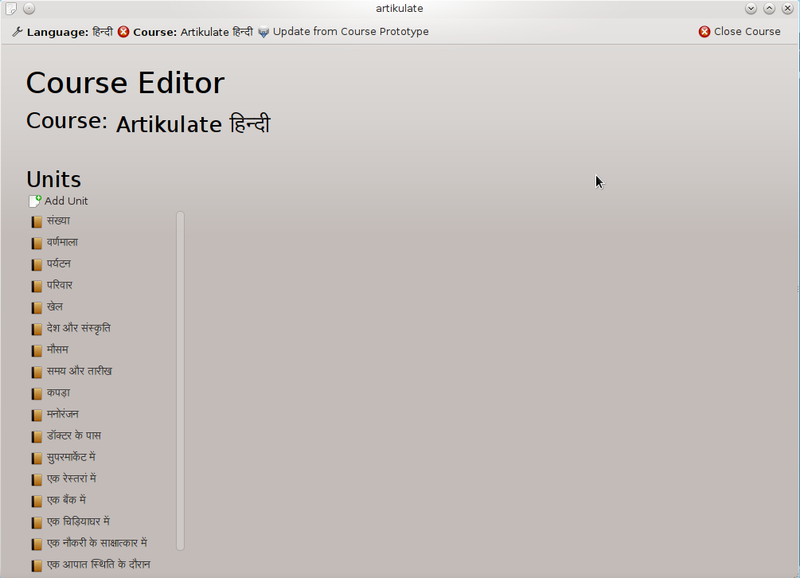 Artikulate is currently in the KDE Edu Playground i.e., it is still under development and has not been released yet. The project contains different courses in various languages which in turn offer a variety of units (scenarios) containing phrases of all lenghts like words, expressions, sentences and paragraphs. The idea is to have recordings of each phrase by native speakers and related phonemes will be tagged to every phrase. The user can now listen to the recordings and try speaking it the same way, recording her own attempts in the process. By comparing the two recordings, she can correct her pronunciations in that specific language. 1. I created an Unit Test that tests all the language files and checks the validation of the schema and also checks if a language file contains the same ‘phoneme id’ more than once. Currently, I am working on adding Bengali which is my mother tongue to the list of languages.